I spent the better part of last evening packing up Skylar’s room for our move this weekend. I had numerous friends and family offer to help me with this task that I have been dreading since the day I put the house on the market. In the end, I decided to do it alone. I wanted time to reflect, to cry, to scream and to talk to her by myself. 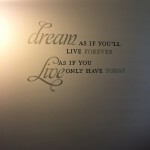 The quote I have attached here “Dream as if you’ll live forever. Live as if you only have today” is posted on Sky’s wall. She hated it. She told me it was dumb, cliche and to take it off of her wall. I would laugh each time she asked me to remove it and say ” no, it reminds me of you.” In the end I won, it stayed on her wall. I sat down yesterday on her floor and I sobbed as I held onto her things and tried desperately to feel her arms around me. I looked up and read this quote, really read it and remembered how much Sky thought it was “stupid”, but how it described her perfectly. She lived, she really lived. I of course cried harder and even managed to laugh at her numerous pleas for me to take it down or her threats to “cover it up.” Then I thanked her, for once again teaching her mother a thing or two about life. 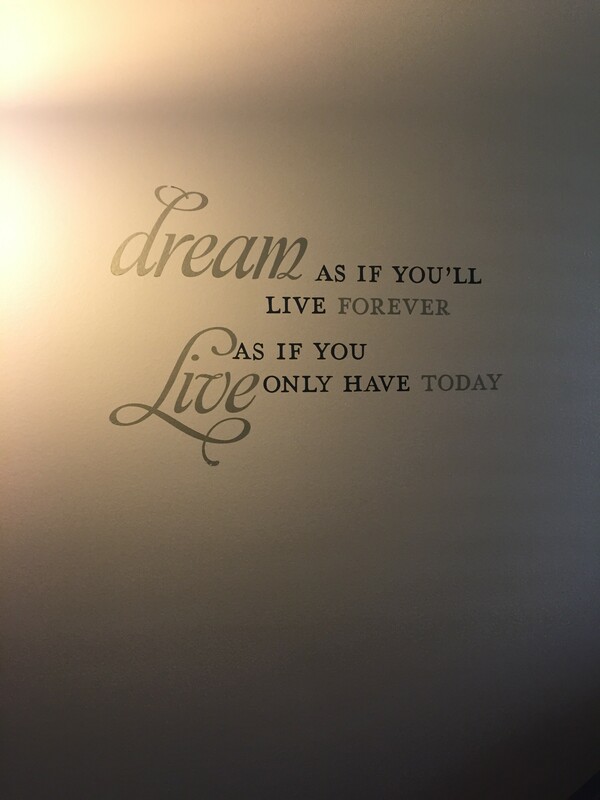 Live as if you only have today…..A cliche we have all undoubtedly stated but do we actually practice it? I doubt it….most of us live as if we have forever to make things right…putting off today what we think we can accomplish tomorrow. I’m guilty, I am sure you are too. I have reminders of these 3 angels all around me, not just in my memory but physical reminders of them in my home, my car, my office, even on my body. Reminders that we don’t get to choose when we go, reminders that life is short, unpredictable, unfair and sometimes downright horrifying. But these are also my reminders of a love so great and a promise so incredible that our human mind can hardly comprehend it. Here is an example of God’s great love and my baby always watching out for her momma. I packed the very last item in Sky’s room yesterday and I stood there in a form of shock and looked around her nearly empty room. Standing there I thought about how Sky will have no “fingerprints” at our new house and my heart broke and I felt my breath catch. In that moment my back door opened and I heard a familiar voice yell “momma – hellllo! !” I walked out of Sky’s room to see Will. Not only Sky’s ex-boyfriend but certainly one of her best friends in the world. A person that loved her and understood my love for her. I hugged him and cried. I couldn’t even tell him how his impromptu drop in was heaven sent, coming at the exact moment that I needed someone to put their arms around me, someone that loved and missed her too. Soon my tears turned to laughs as we joked about Skylar and shared memories. Thank you God, thank you Skylar and thank you Will …..sometimes it’s the little things that become the big things. 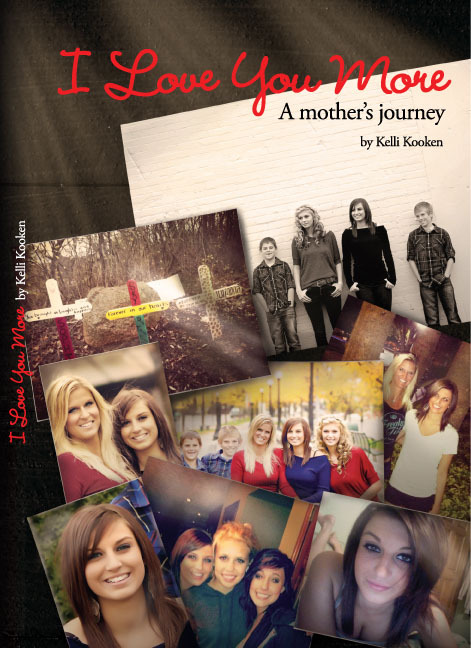 To my fellow grieving and broken moms…. I am at 2 years 8 mos and the pain is not any less, the missing is not any better and the tears still fall when I least expect them. But I have learned to pay attention to signs and to feel when she is near. Every day she lets me know that she is where she is suppose to be. Watch for the signs. Be patient. Open your heart. You too will see them, feel them, hear them. I love you more Skylar Lynn, thank you for continuing to teach your mom a thing or two. I found your blog after stumbling across your GoFundMe page. I have sat at my desk at work for the past few hours reading every word of every blog you have written, tears streaming down my face with each word read. You have a beautiful gift of writing about Skylar and you fulfil your duties of letting her legacy live on. I have a 5 year old daughter myself and I could never imagine going through what you have endured. I will pray for you each day and pray for Sky. I know she is dancing among the angels. I am at 3 years and 2 months since my 23 year old son died and every day is still difficult. His room is basically untouched, except for some items of clothes that I have donated. How difficult a task you faced in packing up your daughter’s room! You’re fortunate to still feel an active connection to Skylar, who seems to be watching out for you. Hi kelli. I have been following your blog since this past November, and although I have never met you, Skylar, Sophie or Julianna, you are so open, descriptive and passionate about your love for them thatI feel as though I know you all well! This link led to your blog and to Skylars story. I lost a very close friend, Rachel in our senior year of high school (October 29, 2001) to a car accident. And that’s exactly what it was, a horrible, life altering accident. A deep puddle (that has since been filled and repaved, ONLY after 2 more teenage fatal accidents) this “puddle” had a tendency to pull/guide/whatever cars into the trees nearby when it rained) Rain, wet roads, deep puddles and inexperienced teenaged drivers do not mix! I have shared your blog with Rachel’s mom, in hopes that your openness, honesty and courage will help her when she is feeling helpless and lost. After 14 years (oh man. It’s been 14 years since I graduated high school?!?) Sharon still has rough days, as I am sure will continue until she and Rach are reunited once again. Your faith, willingness to forgive and love for your kiddos is an inspiration!! Kelli, your pain and emotions are all too familiar. Amy will be gone 5 years on August 20th. I miss her every day and ache to see her and hug her again. I have a voicemail from her on my phone, that I listen to, when I long to hear her voice. I think of you often and pray for you. You have been a source of strength and inspiration to so many. Love you! My journey is at 7 yrs. we lost our 18 yr old son, Ross, when he was a senior in High School. He also died instantly when hitting a tree along with 3 others in the truck. Only difference, Ross, was the driver of the truck. An accident but none the less, we are guilt ridden for the rest of our lives. I have yet to get rid of his clothes or cleaned his room. May angels be with you. Beautifully written. I am sure that she would approve.